Want some milk with that cardboard? Breakfast is a very important meal of the day (so they say). Eggs, bacon, pancakes, and then the ever so popular cereal. Growing up, cereal was by far my favorite breakfast food, being a picky eater that disliked eggs and sausage, it was cereal every morning before school. Frosted flakes, Lucky Charms, or “healthy” options like Raisin Bran and Cheerios were in my usual routine. A bowl of cereal is so common in many households, particularly with children, that people never really think beyond what the box tells them. Now off the top of your mind I am sure you could guess that Oreo O’s and Count Chocula wouldn’t be the healthiest of choices, but what if I told you that ALL cereal, including Chex, Cheerios, Raisin Bran, and Special K were bad for you as well? What if I told you eating the cardboard box your cereal came in was healthier than eating the cereal itself? You’d scoff and roll your eyes I’m sure. Now you may be confused and in denial at this point. I was as well. According to an article by Dr. Steven Sisskind, its not the what is IN the cereal but it is the way the cereal is processed (although I am sure the tons of added sugar doesn’t help the case). When the cereal is being processed in an extruder (the machine that makes ALL cereal) in the factory all the nutrients and proteins in the grain are destroyed. This includes destroying any added vitamins that companies add to make the cereal appear healthier. What does this result in? When the proteins are destroyed all that remain are a TOXIN. Still don’t believe me? Two fascinating studies have been done to prove this theory right. In one study from 1960 conducted at the University of Michigan there were 3 groups of mice. Group 1 received cornflakes and water. Group 2 received the CARDBOARD BOX the cornflakes came in and water. Group 3 received rat food and water. Can you guess what happened folks? The mice that ate the cornflakes DIED before the mice eating the CARDBOARD! Turns out the cardboard had more nourishment than the cereal and the cornflakes resulted in damage to the pancreas, liver and kidneys. Want to read more – check out the entire article here. So there you have it folks. Don’t worry mom, I don’t blame you for the countless bowls I consumed, you along with myself were just doing what marketers made us “think” was right. So spread the word everyone. 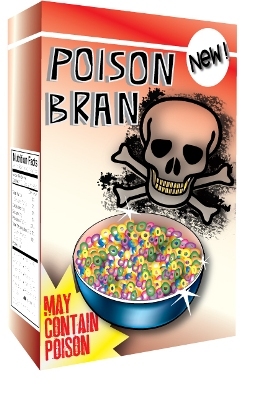 Next time you wake up in the morning or go to feed your children some breakfast, think twice before reaching for the morning cereal box. Perhaps some fresh fruit, some eggs, or some whole grain oatmeal.